Over the past few years, the importance of proper breathing has really been embraced by many coaches and trainers, myself included. Dramatic changes in breathing mechanics lead to positive mobility improvements within minutes, some in seconds, after changing breath patterns. The results don’t always happen that quickly, but the immediate changes I’ve seen by changing breath and rib cage position can be profound. Lie on your belly with your forehead in your hands. Get comfortable and try to relax. The floor will provide proprioceptive feedback to let you feel your belly breathing into the floor so you’ll know you’re doing the exercise correctly. Many people will start by feeling the majority of the breath through the chest with minimal movement within the abdominal midsection. 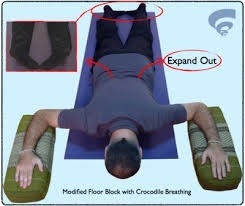 Start to learn “belly breathing” in this position. 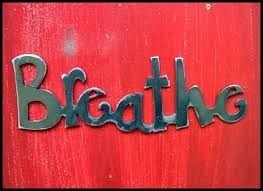 However, you should NOT only focus on breathing into the belly. You should strive to fill up the belly, oblique’s (your side waist areas) low back, and lungs. You should be thinking about getting a very wide breath…360 degrees every time. The floor provides your body with feedback to “feel” that you are breathing wide.